MEDIA BANK has CHANGED. IF YOU REQUIRE EQUIPMENT PLEASE OUTLINE YOUR PROJECT VIA – LOAN REQUEST FORM – PLEASE NOTE CHARGES MAY BE APPLICABLE. As of December 2015, the MAAP Media Bank had sponsored 369 exhibitions and projects to the total value of $1,594,857 (in equivalent commercial hire rates). With the use of audio-visual equipment now mainstream in visual arts practice, this service was invaluable to the creative community. An audit of 2016 loans will be added to this well documented support for artists. The MAAP Media Bank re-purposes audio-visual equipment from its exhibition program, to help artists with creative projects. Launched in 2007, the Media Bank grew organically from MAAP’s existing resources that accumulated from exhibitions. The program promotes the sharing of MAAP’s used equipment as a strategy to support the visual art and new media art communities, and encourage sustainable attitudes towards the consumption of technology. 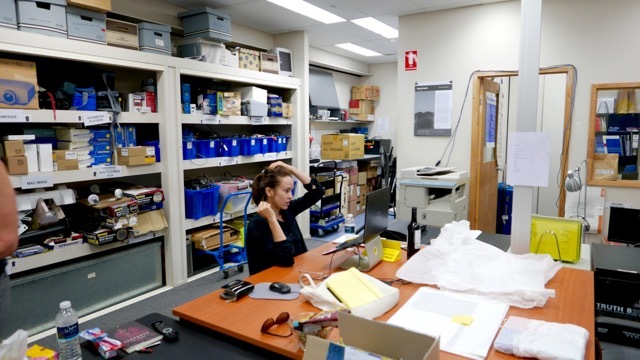 The MAAP Media Bank was established and continues to be supported through the generous support of Arts Queensland, the Brisbane City Council, The Community Benefit Gambling Fund and considerable donations of equipment from individuals, companies and organisations. In 2012, MAAP Media Bank supported 43 exhibitions involving over 60 artists combined equipment sponsorship to artists’ projects $163,222. In 2013, 51 exhibitions supporting over 80 artists combined equipment sponsorship to artists’ projects totalling $106,609. In 2014, 41 exhibitions supporting over 110 artists combined equipment sponsorship to artists’ projects totalling $328,733. In 2015, 32 exhibitions supporting over 162 artists combined equipment sponsorship to artists’ projects totalling $98,040. In 2016, 14 exhibitions supporting over 45 artists combined equipment sponsorship to artists’ projects totalling $86,106. This registers a member to borrow equipment (subject to standard terms & conditions and availability of equipment). The fee is payable by bank deposit before a loan commences or by cash on pick up of equipment. Please do not hesitate to contact MAAP for more information. Annual Institutional Membership Fee $200 +gst. Please note, there may be an additional maintenance fee requested depending on the type of equipment and duration of the exhibition. 2) Attend a group induction session held at MAAP SPACE (111 Constance St, Fortitude Valley), to learn more about MAAP, the MAAP Media Bank and your responsibilities as a member. 4) Engage in other MAAP programs, including our MAAP SPACE gallery program, as committed MAAP supporters. MAAP Media Bank members are involved in a two-way exchange, and we expect that you are interested in the breadth of MAAP’s activities, and not exclusively the opportunity for free equipment. Many of our Media Bank members support MAAP’s free service by engaging in volunteering activities – ask us how you can be involved! Please note that if the induction session you attend is held after the dates of your loan request, you will be able to borrow equipment in the meantime (providing that your loan is approved). DISCLAIMER: Unfortunately MAAP does not have the resources to test all equipment prior to lending, however we encourage you to make a time to come in and test equipment at the MAAP Media Bank HQ before you finalise your loan. If the equipment is faulty, we will endeavour to replace it, providing replacement equipment is available. All equipment loans through the MAAP Media Bank must be acknowledged by way of logo recognition on promotional material.